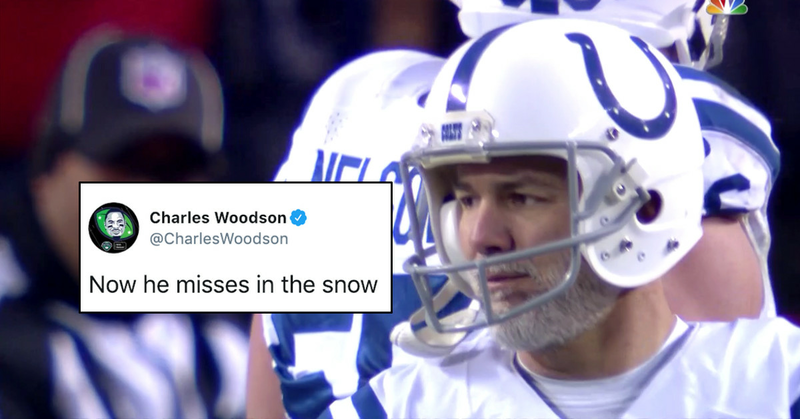 Right before halftime of the Divisional Round between the Kansas City Chiefs and the Indianapolis Colts, 46-year-old Adam Vinatieri missed a 23-yard field goal that would’ve cut the Chiefs’ lead to 24-10. Vinatieri’s miss drew the ire of two people who long been associated with the Oakland Raiders: former Raiders player Charles Woodson and former Raiders executive Amy Trask. When he was with the Patriots, Vinatieri is famous for kicking a 23-yard field goal to win the infamous “Tuck Rule” game in the AFC Divisional Round in January 2002 — a game that many Raiders fans and players still haven’t gotten over 17 years later. Woodson was a defensive back for the Raiders in this game while Amy Trask was the CEO of the team. Before the game, Trask admitted that she hadn’t recovered from it. The Patriots beat the Raiders 16-13 in that game to advance to the AFC Championship, but perhaps Raiders fans can take some solace in Vinatieri missing this kick almost two decades later.